Ukraine’s Drudkh have, over the course of seven previous albums, maintained some anonymity and mysticism in their atmospheric black metal. However eighth effort, Handful Of Stars is a stray away from their old beaten path, one that may surprise and in other regards not. After all, this is a band whom not a lot of people even know look like. Either way this will be divisive one being the band’s second release under Season Of Mist the follow up to the somewhat lukewarm received Microcosmos and more importantly, it being just a different, unexpected record. The dark, seething piano of introductory track ‘Cold Landscapes’ has the ever unnerving Drudkh vibe to begin. But from there the chest opens to reveal a record wholly different from past endeavours – ‘Downfall Of The Epoch’ will edify. Its chiming guitars give way to Thurios’ methodical growl. The same level of ferocity and venom won’t be found too much here and while that may aggravate some, the dabbling on Handful Of Stars is still nothing short of engaging. 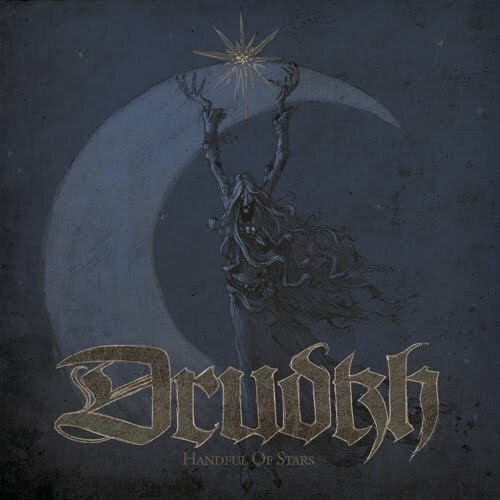 Granted, Drudkh are no strangers to the winds of changes often standing defiantly in the way of its gust, like Songs Of Grief And Solitude, an entirely acoustic Ukrainian folk record. But this album is a “departure” completely to itself. Now, it would be a stretch to call Handful Of Stars a heavy record when it has the likes of Blood In Our Wells as its counterparts. There’s an incongruous shoegaze flagrance at first and with more and more spins it feels as if the jigsaw pieces fall into place and becomes comfortable amongst the harsh vocals. There’s a foreboding sense of melody here but still Handful… is dark in its own right. ‘Towards The Light’ is indicative of this with its harrowing opening guitar work. Overall thought it’s grand and spacious with a memorable resonating and sharp lead riff. For now, Handful Of Stars seems otherworldly but with multiple listens it becomes more and more secure and the realisation sinks in that it is in fact a sterling record indeed.